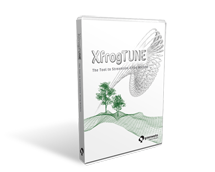 The XfrogTune Reference Manual is a PDF document containing comprehensive information regarding the functionality of the Xfrog Tune Polygon Reducer software, and a tutorial on the usage of XfrogTune to reduce complexity of a Japanese Maple. This model is available to download free here! Learn the basics and get a general overview with the Simple Usage Video. Dig in deep for comprehensive information with the Detailed Usage Video.